This year marks the 30th Anniversary of one of the most recognizable manga/anime creations in Europe, Goldorak –Goldrake, Grandizer, Grendizer, created by mangaka Go Nagai. UFO Robo Grandizer debuted as a manga for Kodansha & an anime for Fuji television in October of 1975. The manga continued until May, 1976 and the anime series ran for 74 episodes ending in February of 1977. Original manga under the Grendizer name, and manga featuring the character as a part of the Manzinger series are highly sought after. The anime series is one of the most popular worldwide on tape and disk. Toys have been produced in Japan by Popy and worldwide by Mattel as part of the Shogun Warriors line. Bandai produced vinyl toys as late as the late 1990s, an early 1980s version with a shooting fist, similar to Bandai’s Godzilla is highly sought after. Mattel produced a Goldrake Shogun Warrior in the European market that was never distributed in America. The Goldrake name was also used for a Grendizer line made by the Italian toy company Atlantic, Fabianaplastica, and Italian toymaker New Toys made a Goldrake series in their popular “Fly by Wire” design. 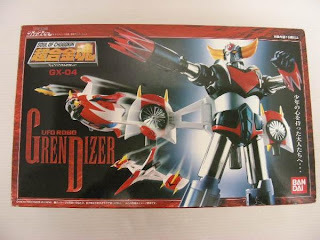 While almost an unknown in the United States, Grendizer collectibles are among the most popular and recognizable worldwide. Find these items on Rinkya! Item Pictured Up for Auction Here!